It seems that a fairly significant number of office buildings have been or are planned to be turned into residential buildings. This trend is nation wide, but particularly strong here in Hartford. What buildings in the downtown area would you MOST want to see turned into Condos, Lofts, or Apartments? I would love to see 750 Main Street(on the right), and the Travelers insurance company building(left) These two buildings are often refered to as central row, and Yes the one on the left is part of the travelers complex, but if it could be seperated and the two buildings converted to residential Hartford would have a really cool place to live downtown. Both buildings would even have penthouse apartments. I figure you could fit about 4 units per floor on the right and 6 per floor on the left. total of about 120 units. I would do the V-shaped office building overlooking Bushnell Park- on the corner of Hudson and Elm. Now those would be some nice condos/apartments. Would it be good for the city to take all of the older class B offices buildings and turn them into residential buildings? Would eliminating all of that office space, consolidating workers into the major buildings be a good thing? It seems to me anyway that 30 buildings operating in a so so capacity is not really a good thing. If however we re use a great deal of that space for other uses, not only would the quality of office space go up, but the vacancy would go down, and lots of housing could be created all over downtown. Even all of the small buildings across from the Civic center could have housing on upper floors. I love that building. It looks so cool when you go around the rotary coming off the Whitehead Hwy. Just a few points to consider. When you convert to a different use, all current code requirements must be met and things like stairs may not be properly configured or in the right place, handicap access may present challenges and the floor plates of an office building which probably work best around 25,000 sf. per plate may be too deep for efficient unit layout (all bedrooms must have windows for example although that problem could be addressed by the creation of an atrium). Mechanical systems, seismic bracing etc. present challenges as well - non insurmountable, but costly. In a perfect world, the ideal office plate is not the ideal residential plate and the floor to floor for efficient residential is a few feet less than office. The final consideration is parking. To date, the market seems to place value on proximate secure parking which could cost $35,000 per space to create. In the end, economics drive development but wouldn't it be better to keep offices as workplaces so that people that move downtown don't have to commute to the burbs for work? The older downtown hotels may present a better opportunity for residential conversion. Yesterday we wanted to construct new office towers in Hartford to house all the state agencies, leaving a vast inventory of the current state buildings going to waste. Today we're vultures trying to kick out offices that aren't in modern Class A space and convert these buildings that have been offices for nearly a century into housing. 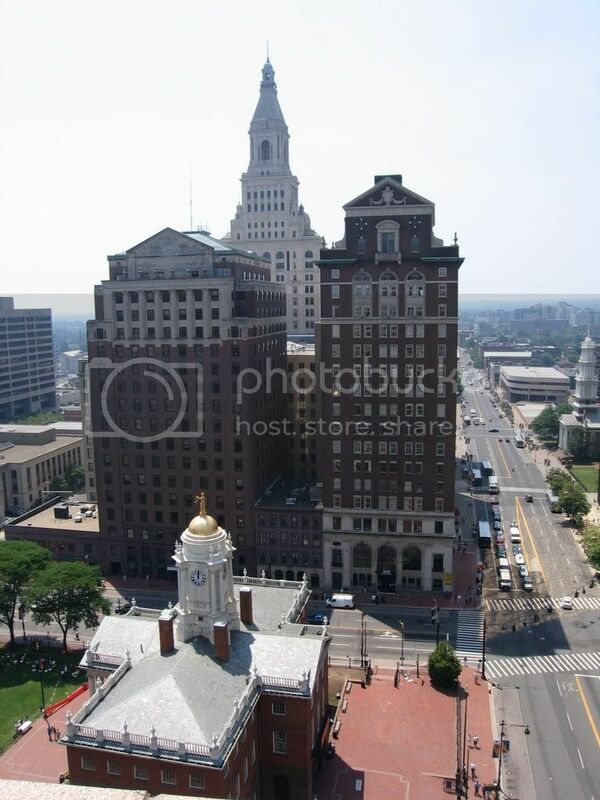 Those two buildings on Main and Central Row are two of Hartford's absolute gems, but gutting them when plenty of people still use them daily doesn't make any sense to me. I think for someone named "Voice of Reason", you should realize the Walt Disney approach to Hartford has never worked. Aren't those two two buildings on Main and Central Row relatively full? I would think the city is getting good tax revenues from those two buildings which will be loss and can't be offset by converting them to residential building. I would love to see the building on the corner of Hudson and Elm change to residential building though. It always reminds me of Dakota NYC. I think the State owns it and therefore it is not contribute to the city's tax base, and the state can move those state bureaucrats into one of the class b under used office building downtown. This is another nice candidate for a condo conversion. 4 storys of residential. right in the middle of all the action. I am not sure how many units could be fit on each floor, but likely 8 or less. I know I would love to live in this building. It is best as it is now of course just because Alkon owns the whole block, and I am sure that whenever this block (parking lot) is developed that keeping the block whole is for the best. I would however love to see many of the buildings on this block turned into upper floor condos so people can live above pratt. and connected to a modern building with underground parking. Yes they are pretty full. The larger one on the left is used by travelers, so I am sure its packed full. 750 Main does not have any spaces listed on Loopnet, but that does not necessarily mean anything. I posted them more as an ideal situation for housing. I by no means think it would be easy or necessarily possible to turn them into housing. if we could magicly move all those jobs into other downtown buildings and turn them into housing I just think they would make great condos. I suppose thats the best way to look at it. which offices around town would make the best conversions. Not a bad idea. Travelers could make up for the lost space by building a new office tower either: on the wasted space of 'Tower Square' between the Tower and Wadsworth, or on the unused space of Constitution Plaza between the Plaza Building and Hartford Club. Many of those buildings on the south side of Pratt Street ARE residential. And they shall be left untouched. The north side has already been ruined, no need to repeat past mistakes by connecting them also.